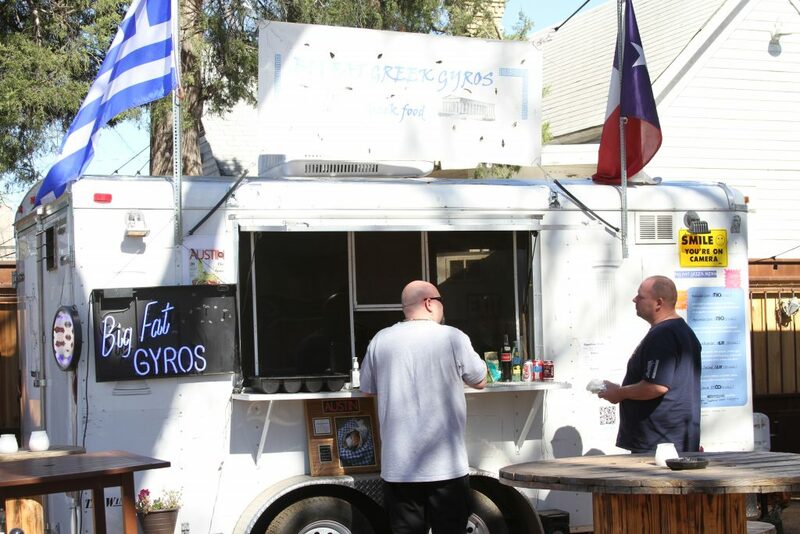 Editor’s Note: Big Fat Greek Gyros has moved to the food truck park on Rainey Street. The Austinot is consistently asked about where to find the best Austin food trucks. So we’ve decided to start a search for the best in town. As we run across Austin food trucks that we like, we’ll let you know. All of the posts in this series will start with “Best Austin Food Trucks.” This is the first review in the series. If you have a food truck to recommend, leave a comment at the end of the article. Tell us the name of the join, what you like most about them, and where we can find them. We’re always willing to check out something new. Take a walk down Rainey Street. On the east side of the street, just after passing Lustre Pearl and before getting to the front steps of The White House, your senses will be assaulted in a tantalizing way. It’s easy to tell when you are approaching Big Fat Greek Gyros, because the sound of Greek music fills the air and the smell of perfectly seasoned meats roasting will draw you in like a moth to a flame. Stop in and place an order. If you do, your senses of sight and taste will be rewarded as you sample one of the best Austin food trucks around. Hercules Gyro with no lettuce at Big Fat Greek Gyros on Rainey St.
Fair warning: the anticipation is tough. This food is made to order and the smell of the gyros is nearly intoxicating in its goodness. While you wait, peer through the window of the trailer. Watch as the pita bread is coated in olive oil and lightly toasted, while the proprietor sings in Greek. Doesn’t get much more authentic on this side of the Atlantic. Emmanuel Papadakis, owner of Big Fat Greek Gyros takes great care with each meal. Big Fat Greek Gyros displays a passionate love for what they do. It shows when each of their Greek masterpieces is served. But the food is just the beginning. The story of owner Emmanuel Papadakis is a fascinating one. He’s a delightful person, the kind of guy who will welcome you as family the first time you meet him. Yep, he already offered to take me to Greece with him, and I might just take him up on the offer. As I interview Emmanuel, there is an undeniable and likable naivety about him. I want to tell him that he needs to be more aware regarding the thoughtlessness of so many people here in the States. That if he’s not careful, he’s going to get burned. I want to tell him to make people pay up front, and then offer them a money back guarantee or something…more…American. Then I realize that Emmanuel is exactly what we need more of: hard working men with great ethics and big dreams. As far as he is concerned, Emmanuel is living the American dream. When I asked if there was anything I could add to my article that would help him, Emmanuel simply said, “I need someone reliable to help me. If anyone is looking for a job and they have a good heart and a strong work ethic, ask them to get in touch with me.” Much can be learned from this man. If anyone reading this wants to get into the food truck industry here in Austin, this is your chance. Emmanuel plans to get a larger truck in the very near future and hopefully a restaurant someday. If you are interested, you can email him: bigfatgreekgyros@gmail.com. 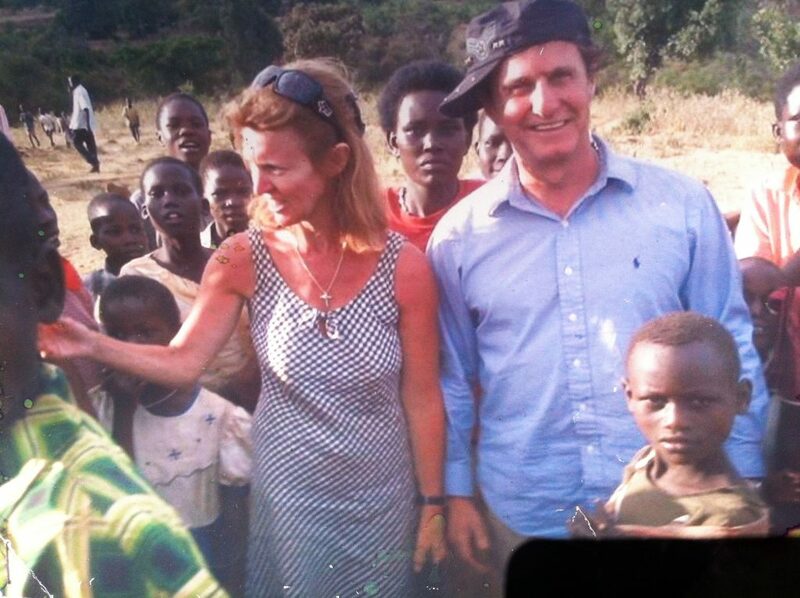 As I wrapped up the interview, Emmanuel said, “Next time you come, we dance. Greek dancing on the tables.” He then proceeded to dance a bit for Brittany and me. He’s a truly delightful man who wears his heart on his sleeve and works hard at one of the best Austin food trucks. 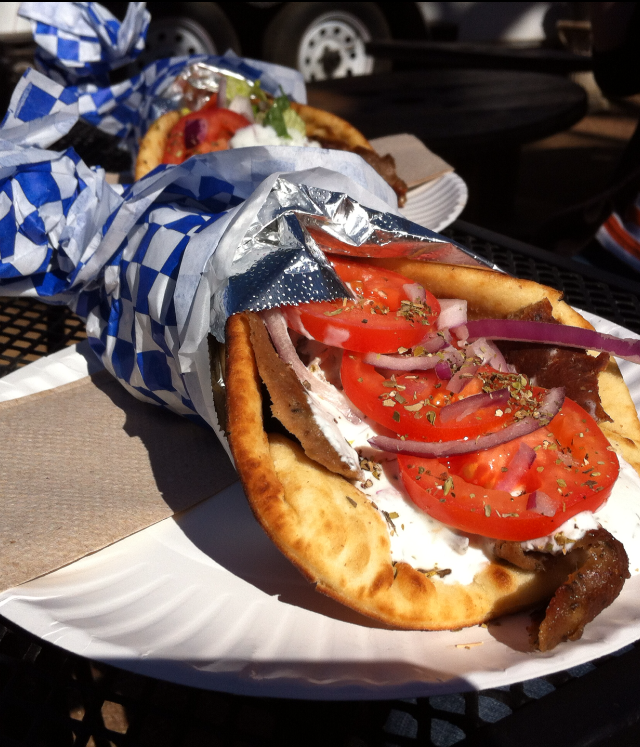 Big Fat Greek Gyros can be found on Rainey Street, in the front yard of The White House in the food truck park. 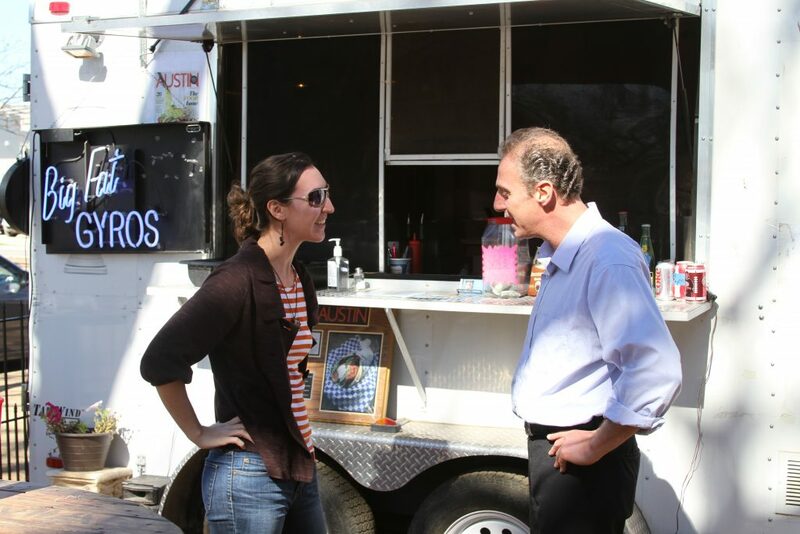 What other Austin food trucks do you think we should check out and why? We always have unique content on the Austinot, and we love to give things away. We only send out our Best of the Austinot newsletter 2 times a month. It’s where we give you a recap of our best articles and where we give stuff away. Interested? Subscribe to Best of the Austinot here!